We are sad to announce that we will not be hosting the downtown Boise Peregrine Falcon web camera this season. We know how much everyone loves to watch the family fledge chicks every year, and hope that you will also enjoy watching our family of American Kestrels again this spring as they raise their chicks just south of Boise. American Kestrels are a declining species throughout much of North America and your assistance to monitor them and provide observations through our interactive website is valuable in helping us to solve the mystery of their decline. The kestrels have just begun investigating the nest for the season, so the camera will “go live” as soon as the first egg is laid. We are also working with the Friends of Camas National Wildlife Refuge who have been setting up a Peregrine Falcon web camera in the refuge for live-streaming. Once that goes online we will notify you so that you can watch that falcon family grow. In addition, we are looking at options to host another camera again in the future. Thank you so much for all of your support and understanding and we look forward to sharing the Bosch KestrelCam and other future web camera opportunities with you soon! We have received confirmation that all of the chicks have successfully fledged the nest! We wanted to thank all of you for watching the FalconCam this season and please come visit us at The World Center for Birds of Prey in Boise, Idaho this summer! Greetings! We are working to get the camera position changed back to the nesting platform. We're not sure why it was repositioned and do not have control over that aspect of the set-up, but will do our best to switch it back quickly so that you can see the chicks again! Thank you for your patience and support! You've probably started to notice that the chicks are not always in view of the camera now. They've become much more active and mobile the past few days and now spend time running around the nest ledge. This stage of development is called the "branching" stage and the chicks are now referred to as "branchers." They will spend a lot of time flapping their wings in the coming days to strengthen their muscles for flight. The Peregrine Falcon chicks are getting new jewelry this morning courtesy of Idaho Department of Fish and Game! They will be banded as well as receive check-ups to ensure that everyone is growing and doing well. This information helps biologists to better monitor Idaho's population of Peregrine Falcons and ensure the overall health of the species. Because of this activity, the camera will be turned off for a short period of time this morning. When it comes back on, you should be able to see all four chicks with their shiny new bands! As many of you have probably noticed, there are now four chicks in the nest! It took us a while to get a good enough look to confirm four little heads, but we were finally able to this afternoon. We first suspected that there were more than three after receiving an email message from falcon fans Don and Mary K., so special thanks to them for asking about it! Anyone watching will notice that the chicks are growing very quickly at this point. At one time yesterday morning we noticed only 20 minutes between feedings and yesterday afternoon the female brought in an enormous pigeon for dinner! Both the male and female are often out hunting at this point since it's warm enough outside during the day that the chicks don't need to be constantly incubated. Just in time for Mother's Day weekend, we have chicks in the nest! The first two chicks hatched at some point before noon yesterday. We're keeping an eye out for others, but mom has been doing a really good job of incubating! The other eggs should hatch at sometime in the next few days, so keep a lookout for them! The young falcons will grow up quickly. When they hatch, they are covered with fluffy white down and have very large feet in proportion to their bodies, but in just 5-6 weeks, the falcons will be fully feathered and ready to fly. Edit: We just saw mama get up and there are 3 chicks hatched! Happy Birthday, little fuzz-ball! Happy Earth Day to all of our falcon-watching friends! Earth Day is kind of a big deal for Peregrine Falcons. It was in the late 60s and early 70s that scientists, falconers, and bird watchers started working to save Peregrine Falcons in North America. Earth Day and the environmental revolution helped bring about awareness across the continent and paved the way for the banning of DDT and the development of the Endangered Species Act. The first Earth Day was an exciting time for wildlife conservation. Today is equally as exciting. The Peregrine Falcon was removed from the federal Endangered Species List in 1999, but we haven't stopped working to save species. The Peregrine Fund today is taking the lessons learned from our efforts to help in the recovery of the Peregrine Falcon and is using the information to save raptors world wide! From critically endangered vultures in Africa to Gyrfalcons in Alaska to Ridgways Hawks in the Dominican Republic to California Condors in Arizona your support enables us to ensure these magnificent birds are around for many future generations. So take some time today to appreciate our growing family of Peregrine Falcons in Boise, Idaho and reflect on just how successful we can be in saving species when we work together! If you're looking for a way to give back this Earth Day, make a contribution in celebration of Peregrines everywhere at: https://idahogives.razoo.com/us/story/Peregrine-Fund. Your gift will help in the quest to recover the California Condor so that it too can be removed from the Endangered Species List! We've had a few folks notice that the video is a bit foggy...it's likely that the lens on the camera is smeared. Falcons can be a bit messy, but if we were to go up and clean the lens right now, it would disturb the parents and nest. Idaho Department of Fish and Game makes sure to clean it each year when they're banding the chicks, so we will have to wait until then to clear it up. Thanks for your patience and for now, please enjoy our blurry feathered family! The female Peregrine Falcon is already incubating eggs, and we’re excited to see that 4 eggs have been laid. Peregrine Falcon eggs are typically incubated for an average of 34 days before hatching which means our first chicks should make an appearance at the beginning of May. Good news—a pair of Peregrines has been courting on the nest ledge for several weeks! We're working with our partners to turn on the cameras and broadcast video to this page. Please click the blue button at the upper right and sign up for notifications — we'll let you know the minute we go live! Dented, thin-shelled Peregrine eggs, a result of DDT contamination in the parents' food. When The Peregrine Fund was founded in 1970, Peregrine Falcons were in danger of extinction in North America and Europe. The falcons had disappeared from the eastern half of the United States and were in serious decline west of the Mississippi River. At the first Peregrine Conference in 1965, biologists concluded that the unprecedented population crash coincided with the widespread use of DDT and other pesticides. Many experts and falconers believed that breeding the birds in captivity would keep the species alive should the wild population become extinct. At a second meeting in 1969, participants asked the United States, Canada, and Mexico to protect Peregrine Falcons. In 1970, the U.S. Department of Interior listed the Peregrine as endangered. The use of DDT was banned in 1972. The Peregrine Falcon remained in the endangered category when Congress approved the Endangered Species Act in 1973. The first captive breeding facility was built at Cornell University, where Dr. Tom Cade had recently joined the faculty. In 1970, a 40-chamber barn, dubbed “Peregrine Palace,” near Cornell’s Laboratory of Ornithology became the home of the recovery effort. The same year, two schoolboys sent money to Tom to save the falcon from extinction. He deposited in a fund for that purpose, and The Peregrine Fund was born. The captive breeding effort began with birds from the wild and donated by falconers. The first breeding season occurred in the spring of 1971. That first season wasn’t easy. Only a few birds of prey had ever been bred successfully in captivity at the time and useful information was limited. But a few early cases proved that it could be done. Over the years, Tom and his crew persevered, pioneering innovative techniques to produce viable eggs, healthy chicks, and fledglings capable of surviving in the wild. In 1974, four of the 23 Peregrine Falcons produced that year were released to the wild to see what would work best on a large scale: hacking, fostering, cross-fostering, and released adult mated pairs. Two chicks were placed in the nest of an adult pair that had lost their eggs earlier in the season. The foster parents successfully raised them to fledging. The other two were released using the hacking method using a box, platform, or other structure and supplemental feeding until independence. 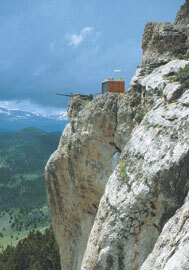 One of many western hack sites; this one was carried to the cliffside by helicopter. Hack sites proved to be a highly effective way to release young birds. Biologists scaled rugged mountains and rappelled down steep cliffs to install hack boxes where juvenile falcons would have a good chance to survive. Hack-site attendants braved howling winds, snow and cold, bears, insects, and rattlesnakes to feed and monitor the young birds until they dispersed. From 1974 to 1997, nearly 4,000 captive-bred falcons were released to the wild throughout the United States. Always a rare bird even in the best of times, the Peregrine Falcon now is found throughout nearly all of its historical range in North America, as well as in areas where it never was before. To the delight of urban dwellers, the falcons have adapted to tall buildings reminiscent of their natural cliff habitat. Building ledges and artificial nest boxes provide places to rear their young and pigeons and city birds like pigeons are an excellent food source. In 1999, the people who had participated in what became one of the most successful recovery efforts in history gathered for a celebration at The Peregrine Fund’s World Center for Birds of Prey in Boise, Idaho. The occasion: official removal of the Peregrine Falcon from the U.S. Endangered Species List. Jamie Rappaport Clark, director of the U.S. 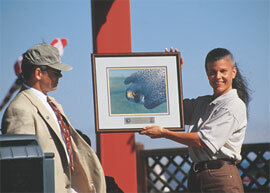 Fish and Wildlife Service, presented a gift to Peregrine Fund President Bill Burnham in honor of the proposed delisting of Peregrine Falcons in 1999. Public support has been vital to the falcon’s recovery from the beginning. Rachel Carson’s landmark book, “Silent Spring,” captured the public’s attention about an alarming loss of wildlife. As people learned more about the plight of the Peregrine Falcon in articles, media reports, books, and films, they responded with money and support. Through the years, thousands of individuals and many falconry clubs, conservation groups, federal and state agencies, and private businesses and landowners became partners in the project. As it did with DDT, the Peregrine Falcon continues to be an excellent indicator warning of contaminants in the environment, such as possible effects of the 2010 oil spill in the Gulf of Mexico. Research on this tenacious bird now spans a half-century, providing a wealth of data that can be used to ensure the health and safety of many species, including humans. Falcons do not build nests. Eggs are laid and incubated in a “scrape,” which the falcons build by pushing the gravel out behind them with their legs. The birds “bow” to each other by leaning forward with their heads low and their tails held high. They make an “ee-chupping” sound. Both the male and female bow and vocalize over the scrape and may touch bills. The male offers food to the female, which takes it from his talons or beak, often accompanied by ee-chups or loud vocalizations. Peregrine Falcons generally keep the same mate from year to year, but if one dies, the surviving bird will seek another. A typical clutch is three to four eggs, which are incubated for 32 to 35 days. The parents will use their beaks to roll and shift the eggs periodically during incubation. The male assists by sitting on the eggs while the female leaves to eat. The eggs will not hatch if they are infertile or the young dies during incubation. 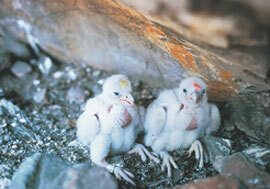 Called an eyas, a chick stays warm under its parent during the brooding period. Chicks are fed by both parents, who make sure each chick receives enough to eat. They are in the nest for six to seven weeks. Chicks prepare to leave the nest by flapping their wings in the nest, then taking short test flights. For about six weeks, they continue to be fed by their parents while honing their flying and hunting skills before striking out on their own. Learn more about Peregrine Falcons in our Explore Raptors feature! Where are the nest and webcam located? The camera is attached to a nest box on the 14th floor of the One Capital Center Building, 10th and Main streets, in downtown Boise. The box is on a ledge on the northwest corner of the building. The webcam may be viewed on a television monitor in the lobby. What happened at this nest last year? The Peregrine Falcon was removed from the U.S. Endangered Species List in 1999. The Peregrine Fund was established in 1970 to recover the species by producing young birds in captivity and releasing them to the wild. The population of the species continues to be monitored by the U.S. Fish and Wildlife Service and individual states. How did the falcons become endangered? The population had been decimated by DDT, a pesticide that thinned the eggshells of many types of birds of prey, including the Bald Eagle. The use of DDT was banned in the United States in 1972. How are they doing in Idaho? In 2009, The Idaho Department of Fish and Game removed the Peregrine Falcon from the state endangered species list on the 10th anniversary of the federal delisting. Like all birds of prey, the Peregrine Falcon remains fully protected by state and federal law. When did recovery begin in the state? Peregrine Falcons were essentially gone from Idaho by 1974. Starting in 1982, captive-bred falcons were released to the wild in Idaho and nearby states. In 1995, the raptors were again documented as a breeding species and releases were discontinued. Eight falcons were released in downtown Boise in 1988 and 1989. Today, there are about two dozen breeding pairs scattered around the state. The video should work on both desktop and mobile systems, regardless of operating system or browser. If you have difficulty viewing the video, please contact streaming@fiberpipe.net. For this season, the video should work on both desktop and mobile systems, regardless of operating system or browser. If you have difficulty viewing the video, please contact streaming@fiberpipe.net. Visit our Explore Raptors section to learn about Peregrine Falcons and other raptors. Two young boys first put the “fund” in The Peregrine Fund by sending money to founder Tom Cade in 1970. You can continue their legacy — donate today to conserve birds of prey around the world.